CINCINNATI -- This is a story about two people who overcame the despair of homelessness and addiction and want to help others find their own stability and hope. Jessie Griffith and John "Joker" Adams are scheduled to get training in December to become certified peer support specialists so they can assist people grappling with homelessness, addiction and mental illness. They are among four men and two women whose training will be funded by Maslow's Army . The local nonprofit works to help people experiencing homelessness and poverty meet their basic needs and build better lives for themselves and their families. 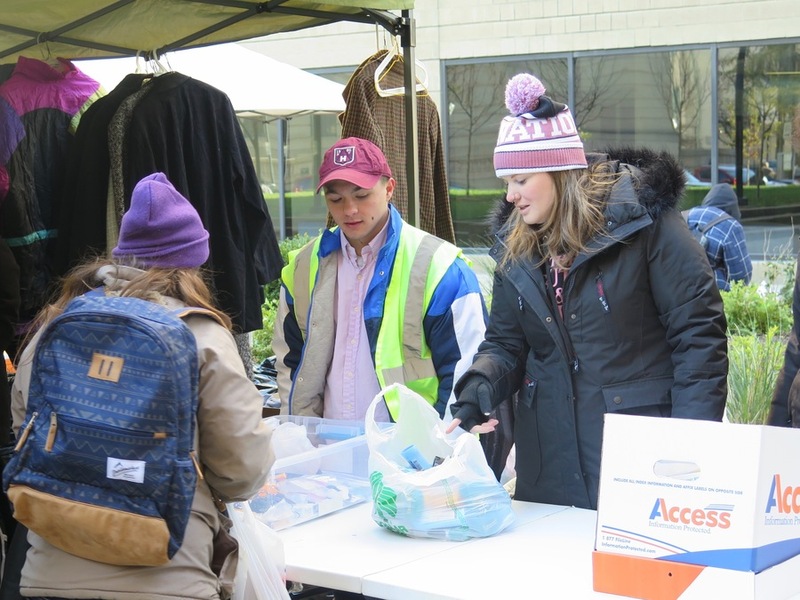 Although Maslow's Army has long sponsored volunteers unofficially to become mentors to the people the organization serves, having a more formal program has always been a goal, said president and co-founder Samuel Landis. Griffith and Adams are ideal candidates for the training, he said. "We watched them smile again and be comfortable with who they are and really getting to that point of self-awareness and going back out there and lending a hand up to their other brothers and sisters who are struggling as well," Landis said. "They're very passionate about and compassionate about people that are experiencing issues such as homelessness or addiction and mental illness." Next month's training will teach Griffith and Adams how to use their own life experiences to help others while following a strict code of ethics, he said. "No matter what we've done with our lives, any experience we have can become our greatest asset if we're able to share and talk about those experiences," Landis said. That's what Griffith and Adams aim to do. Adams was homeless when he met Landis at Maslow's Army's very first outreach on Fountain Square back in January 2017. His nickname is "Joker" because of his face tattoos that look like permanent, blue clown makeup. Adams had a tough childhood, he said, and grew up mostly in institutions. He didn't stay on the outside too long after he became an adult and said he got the tattoos when he was serving time in an Oklahoma prison for drug charges. The prison was a tough environment filled with racial animosity, Adams said, and he felt like the tattoos were something he needed to do at the time. He moved to Cincinnati several years ago with a woman he married, but their living arrangement fell apart, and they quickly became homeless. They're now in the process of getting divorced. "Because of my tattoos, people think I'm a bad person. They think I'm a drug addict," said Adams, who is 28. "I'm actually in recovery. I haven't done nothing in over two years. I'm just out here helping everybody I can at all costs." John "Joker" Adams, right, distributing hygiene products at a Maslow's Army outreach. 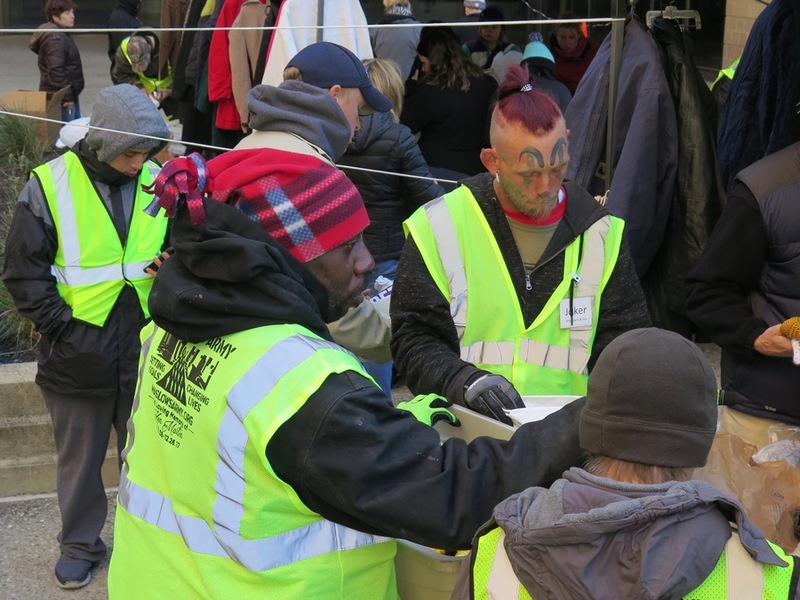 Adams was part of the Downtown homeless encampment controversy over the summer and worked closely with Maslow's Army to try to help others who lived on the streets like he did, Landis said. Street outreach workers funded by Downtown Cincinnati Inc. and staff at Greater Cincinnati Behavioral Health and Talbert House helped Adams get housing about a month ago. After being homeless for roughly two years, Adams now lives in Western Hills and plans to start taking classes at Gateway Community & Technical College in January. In the meantime, he rides his bike Downtown daily to help people however he can, and he never misses Maslow's Army's weekly events each Sunday where the group passes out free pizza, clothing and hygiene products to people in need. He's even mentoring 32-year-old Christopher Sherry now, trying to help Sherry through his struggles. "I'm really a nobody that's trying to do something," Adams said. "And I give my time and my effort." He went with Landis and other Maslow's Army volunteers to Hamilton, Ohio, earlier this year to help people at a homeless encampment there. When Landis posted a video of their efforts on social media, many people responded with unkind remarks about Adams because of his face tattoos. "Never judge a book by its cover," Landis said. "He's always helping people get into shelters because he knows the system. He is the epitome of what we're trying to do." Griffith's journey has been very different. She grew up in a family surrounded by addiction and became a heavy drinker and used drugs, too. "I was very functioning. I always kept a job. I went to beauty school," she said. "I started doing harder drugs when I was, like, 28, and that's when I started doing opiates." Jessie Griffith, right, distributing hygiene products at a Maslow's Army outreach. Griffith's family knew about her drinking and other drug use, she said, but not about the opiates. "The day before I decided to get sober, a girl I knew overdosed," said Griffith, who is now 37 and six years clean. "This was eight years ago. It wasn't as frequent as it is now. And I decided that I didn't want to do that to my family. I didn't want them to hear about me dying not even knowing that I was doing opiates." She got involved with 12-step programs and worked to get clean herself rather than entering a recovery program, but before she was even 30 days sober, there was a domestic dispute where she had been living. "That happened on Christmas Eve of 2010. I had nowhere to go that was safe, and I had Christmas money in my pocket," Griffith said. "So I knew if I went to a using friend's house, I would probably relapse." She went to a 12-step meeting on Christmas Day, tearfully told her story and asked for suggestions. People there told her to go to a homeless shelter, and she ended up at the YWCA's House of Peace for battered women and children. "I was there three months. I went in with nothing but the clothes on my back," she said. "It was tough." However, Griffith, who lives in Clermont County and works full time as a restaurant server, has come to realize the house where she stayed was far more comfortable than the living conditions of so many of the people she serves through Maslow's Army. She began volunteering with the organization after hearing about the death of Ken Martin, a man who had gotten help through Maslow's Army but relapsed and was found dead at a freezing cold Government Square bus stop on Dec. 26, 2017. Griffith has been a steady presence since January. "It's made me more open-minded, more compassionate," she said. "I had no idea, you know, that Maslow's Army would become my family." Griffith said she hopes the training she gets in December can prepare her for a new career of helping people. "I feel like I've found my passion," she said. "It feels really good to know that I am helping people." Landis likes to say: "Gratitude is an action word and not a feeling." "To be thankful," he said, "is to pay it forward." That's exactly what Griffith and Adams want to keep doing. More information about Maslow's Army is available online .